Why Get a Total Knee If You Only Need a Partial? 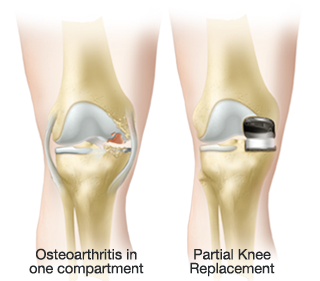 The advantage of a partial knee is that it resurfaces only the damaged cartilage of the knee, preserving the undamaged cartilage. You and your surgeon will determine if a partial knee is appropriate for you. If you're a candidate for the Oxford® Partial Knee with Signature™** technology, your preoperative experience will be similar to most partial knee patients, except an MRI of your affected leg will also be required. The typical MRI scan will last approximately 20 minutes. The scan will only be performed on the hip, knee and ankle, so your head will remain outside of the machine. The MRI is used for preoperative planning by your surgeon and for the design and manufacture of the Signature™ personalized positioning guides that will be used during your partial knee replacement. After surgery, you will probably be hospitalized for one to three days. Recovery time varies, but most people are able to drive after two weeks, garden after three to four weeks, and golf after six to eight weeks. Your surgeon will tell you when and what activities you can return to and what activities to avoid. or search for an Oxford Partial Knee trained surgeon in your area.